New Mads, new captives, new puppeteers, new directors – oh my! From the mind and mouth of madness of Joel Hodgson comes MYSTERY SCIENCE THEATER 3000: THE RETURN! After 18 years, and millions of fans gnashing their teeth and milling aimlessly in the American Programming wasteland aimed at the Great Unwashed, creator/ writer/ director/ star Joel Hodgson reclaims the airwaves in the name of quirky intelligence with his original brainchild that made him a cult superstar. The first season of MYSTERY SCIENCE THEATER 3000: THE RETURN is on Netflix, and they’ve started the labeling at Season 1 (but we all know – wink wink – it’s really Season 11; Season 10 wrapped on the Sci Fi Channel on September 12, 1999). At its base, MYSTERY SCIENCE THEATER 3000 (MST3K) is simply a guy and two robots (‘bots) talking over bad movies; in its construction, it is “riffing” (i.e. wisecracking) on the movie’s execution, the acting, the stars, the production; as its ethos, MST3K’s riffs and social commentary draw from the vast cultural landscape of media, literature and social flashpoints, brewing a mélange of verbal jocularity that is inexplicably amorphous and devastatingly entertaining. From its humble beginnings at the local KTMA TV station in Minneapolis-St. Paul in September 1988, MYSTERY SCIENCE THEATER 3000 would find its cult footing; by mid-1989, the show had become the mainstay of then-fledgling network Comedy Central, re-runs playing daily, mini-episodes produced for prime time, and new weekly episodes every Saturday night. In 1996 came MYSTERY SCIENCE THEATER 3000: THE MOVIE. By 1997, Comedy Central had disgracefully cancelled MST3K (due to changing formats and – so they say – falling ratings), and the show moved to the Sci Fi Channel, until its ultimate demise in 1999. Were it not for the petty minds at Sci Fi that wanted to wreak changes on the format so deviously simple yet so successful, the show would probably still be there. The New Mads: Smokin’ and Pudgy… ‘Smudgy’? THE RETURN on Netflix, made possible by Kickstarter, is helmed by Joel Hodgson, the mastermind himself, with his finger in every pie, from writing, directing, and producing, to appearing in various cameos in the middle background, allowing the all-new on-camera talent to drive the new dynamic. By the middle of the first episode, I was laughing in ecstasy at recognizing my dear friend roaring back to life on the operating table. These new MST3K operators were doing it! Insidiously making me love them with all that forsaken love I had channeled elsewhere for nearly two decades. After the clunky exposition of this new breed of old panther, Joel keeps the format pretty intact; We get some favorite old conventions: the title card “Turn Down Your Lights (where applicable)”; a new doorway sequence (upgraded, with digital effects); the “invention exchange” is revitalized (although, this first episode’s exchange is quite lame), and many of the catch-phrases will conjure nostalgia: “Movie sign!” “The Mads are calling,” “Send them the movie,” etc. The same bots are here to tangle (Tom Servo, Crow T. Robot and Gypsy – with new operators and voicers), and – a key component to the show’s likeability – there is still a man “trapped in space” on the Satellite of Love. After 18 years – back in the theater. We are home again. And what of The Mad Scientists – the other key element that would make this whole beargarden bearable? Oswalt as Max is suitably put-upon by his boss Kinga, and harbors an unrequited love for her. And Day as Kinga purveys her loquacious, megalomaniacal role with verve. But there is a change in the dynamic between the two Mads. Max can never have the boisterous relationship that Frank enjoyed with Dr. Forrester, because Kinga is, for all her severe uniforms and violent tendencies, a smokin’ hot tamale. It’s not politically correct to state as a reason anymore, but Felicia Day’s hotness dilutes her badness. No matter what evil she tries to distract us with, there’s a certain demographic that will gaze dreamily at the screen and imagine her doing it to THEM. Yes, I mean men. Is this a failing or a plus for the show? I’m putting it in the plus column, because in the master-victim relationship between Kinga and Max and Jonah, that new dynamic is explosive. In my pants. 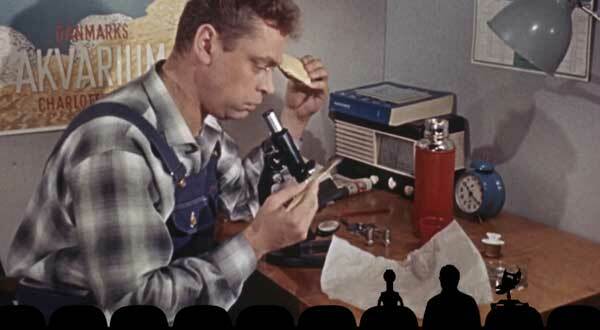 With the better production values and bigger budget, we are loathe to admit that MST3K has indeed lost some of its quirky DIY charm. For instance, the “door sequence” looks like stop-motion (or digital) and reveals much more detail and ganglion, as if each area is a different room of the satellite (kitchen, workroom, etc. ); Servo now has working arms (a running gag always used to be his useless little spring-based arms – yet he somehow still produced projects that would require two working arms – how, is anyone’s guess) and he can now “fly” in the theater, putting his “hoverskirt” to good use; Gypsy is streamlined to appear from the roof; Jonah’s “artist’s renderings” are well-drawn cutouts, instead of Joel’s tatty sketches. And the cameos must have cost a pretty penny: Neil Patrick Harris, Jerry Seinfeld, Mark Hamill! What takes us back the most to the glory days is, thankfully, the art of MST3K, the singular hook that sets it apart from all other shows – the riffs. The cannonade of jokes from the three shadows in the theater. From silly to socially observant, from Spinal Tap to Shakespeare, the riffing takes us back to that heady emotion we felt in the early nineties – that the world wasn’t all ignorant and hateful, that all of America was not like Southern California with its Me-First attitude, Valley bims and killer cops. And as well as calling back previous classic one-liners (“Watch out for snakes!” “How about a little fire, Scarecrow?” “It stinks!”), and referencing both Mike’s and Joel’s eras, as well as the men themselves, the gang can now tap into every piece of social insanity from the past 18 years, including the STAR WARS prequels, LORD OF THE RINGS, 9-11, Obama and recent politics, etc. Crow (voiced by Hampton Yount) still sounds like Crow (meaning Trace Beaulieu), Tom Servo (Baron Vaughn) sounds slightly different (and very similar to Jonah; it took a few episodes to differentiate the two), and Jonah is of course, Not Joel, but he’s got an endearing, innocent style much like Joel’s (even though I’ve never been a fan of his standup comedy). They’ve captured the spirit, they’ve emulated the tone, they’ve got it right! The end credits roll features a heftier crew and staff, akin to the production of a movie, rather than the short list of homemade artisans who stamped their sweat and blood on the original episodes. The roll also features (in very small print) every single contributor to the Kickstarter campaign that re-launched MST3K. The first episode scrolls the A’s and it continues down the alphabet over the course of episodes. aka: MYSTERY SCIENCE THEATER 3000 – SEASON 11. Starring: Felicia Day, Patton Oswalt, Jonah Ray, Baron Vaughn, Hampton Yount, Rebecca Hanson, Joel Hodgson.